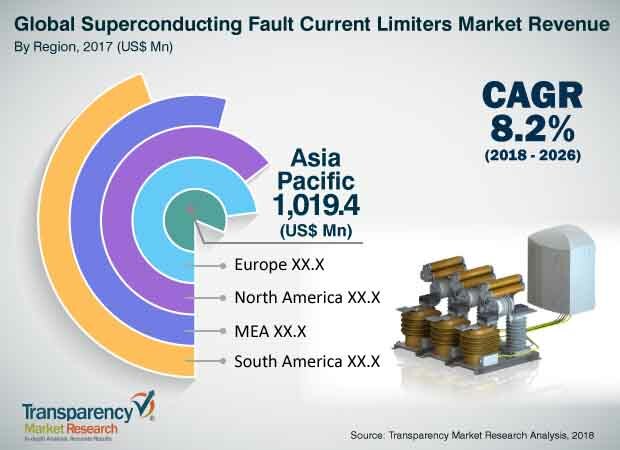 According to a new market report on the superconducting fault current limiter market, published by Transparency Market Research, the global superconducting fault current limiter (SFCL) market is expected to reach US$ 6,120.4 Mn by 2026, expanding at a CAGR of 8.2 % from 2018 to 2026. According to the report, the global market will continue to be influenced by a range of macroeconomic and industry-specific factors. Asia Pacific will continue to be at the forefront of global demand, with the market in the region growing at a CAGR of 9.4% through 2026. Due to increase in power demand and concerns regarding power supply, it is inevitable that distributed generation (DG) will experience higher market adoption in electric power distribution and transmission systems in the coming years. With a high diffusion of DG, a high-level fault current may be caused during an emergency, which would have a negative effect on the complete power grid including the linked DGs. SFCL can be implemented to prevent distributed generating sources from blackout in smart grid systems, because this fault current may be higher than the rating of existing protective devices. Frequent failure in power systems has increased the demand for these applications, thereby offering multiple opportunities to the global SFCL market. The global superconducting fault current limiter market has been broadly segmented in terms of type and end-use industry. By type, the shielded core SFCL segment is consistently expected to witness the highest market share between 2018 and 2026. Growing urbanization which is resulting in the growth of power distribution & transmission networks as well as commercial buildings, is the major factor responsible for its high share. Moreover, growing demand for efficient power supply is another factor accounting for its dominance throughout the forecast period.However, of all types, resistive SFCL segment is expected to expand at a CAGR of 7.8% due to its increasing applications in power stations and in the oil & gas industry. By end-use industry, transmission & distribution grid cumulatively represented 26.3% share in 2017. Rapid urbanization especially in the developing countries of Asia Pacific and the Middle East is aiding the growth of SFCL in power grids. Furthermore, increasing government initiatives across the world for the renewal of existing transmission and distribution networksis further driving its significant share amongst all other applications. Asia Pacific dominated the superconducting fault current limiter market in 2017 with China contributing majority share of income. The dominance of the region in the market is attributed to its large population base, increasing industrialization and urbanization, growth in transmission and distribution networks, and supportive governmental initiatives for expansion or upgrade of existing systems. Analyzing the Asia Pacific superconducting fault current limiter market at country level, it is anticipated that China would lead the market consistently throughout the forecast period. The country has the highest number of superconducting fault current limiter manufacturers and its production is more than double the size of the next largestsuperconducting fault current limiter producing country. Apart from China, India and Japan are also expected to contribute significantly to the Asia Pacific superconducting fault current limiter market. The superconducting fault current limiter market in India is expected to expand at the highest share of 10.2% during the forecast period. Although North America and Europe collectively contributed 55.5% of the global share in 2017, it is expected to slightly decrease till 2026 due to the mature superconducting fault current limiter market in the regions. The research study includes profiles of leading companies operating in the global superconducting fault current limiter market. Market players have been profiled in terms of attributes such as company overview, financial overview, business strategies, and recent developments. Key players in the superconducting fault current limiter market are ABB Ltd, Siemens AG, Toshiba Corporation, Nexans, Furukawa Electric Co., Ltd, Applied Materials, Inc., Northern Powergrid, Superconductor Technologies, Inc., and American Superconductor (AMSC) among others. Companies are focusing on expanding their business through strategic acquisitions and partnerships with several end-use industries.